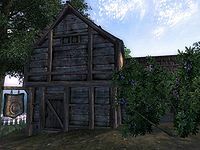 The Aleswell Inn is located in the settlement of Aleswell, northwest of Fort Caractacus (quest-related). The inn is run jointly by the three siblings Diram, Adosi, and Urnsi Serethi. Strangely, none of them offer any services and none of the rooms in the inn can be rented, even after completing the related quest (see below). The ground floor contains the main reception area, which consists of a bar with a counter and a dining room. The inn's guest rooms are upstairs. On the second floor are two doorless rooms, both containing a bedroll and a chest of drawers. 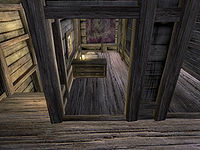 Only after completing the related quest, the bed and chest of drawers in the first upstairs room to the left are tagged as player owned and the chest of drawers will no longer respawn. Therefore after completing the quest, you are free to sleep in this bed and may safely store your items in the chest of drawers. Esta página foi modificada pela última vez à(s) 06h31min de 15 de fevereiro de 2014.